Global fencing market expected to reach approximately USD 35,810.36 Million by 2024, growing at a CAGR of around 4.92% between 2018 and 2024. High residential renovations and increasing construction projects. However, market maturity can be a factor hindering the global fencing market over the forecast period. The report covers forecast and analysis for the fencing market on a global and regional level. The study provides historical data along with a forecast from 2018 to 2024 based on revenue (USD Million). The study includes drivers and restraints for the fencing market along with the impact they have on the demand over the forecast period. Additionally, the report includes the study of opportunities and threats to fencing market on a global level. To understand the competitive landscape in the market, an analysis of Porter’s Five Forces model for the fencing market has also been included. The study encompasses a market attractiveness analysis, wherein the material and end-user segments are benchmarked based on their market size, growth rate, and general attractiveness. 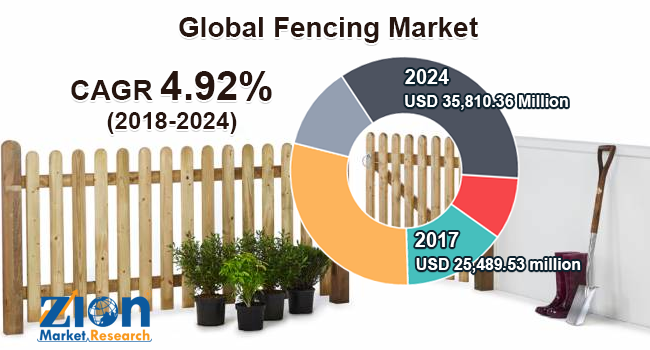 The study provides a decisive view of the fencing market by segmenting the market based on material, end-users, and regions. All the segments have been analyzed based on present and future trends and the market is estimated from 2018 to 2024. Based on material, the fencing market is segmented into concrete fencing, plastic and composite fencing, wood fencing, metal fencing, and others. Based on end-user, the fencing market is further segmented into industrial, commercial, residential, and agricultural. The regional Segmentation includes the current and forecast demand for North America, Europe, Asia Pacific, Latin America, and the Middle East and Africa with its further divided into major countries including Germany, France, the U.K., the U.S., China, Japan, India, and Brazil. Some of the key manufacturers involved in the global fencing market are Betafence NV, Jerith Manufacturing Company Inc., CertainTeed Corporation, Gregory Industries Inc., Ply Gem Holdings Inc., Bekaert, Long Fence Company Inc., Associated Materials LLC, Ameristar Fence Products Inc., and Allied Tube and Conduit. The report includes detailed profiles including a company overview, key developments, business strategies, financial overview, etc. of key players operating in the global market.